I thought it appropriate to bring to your notice the following. I have no doubt that you are aware cable crossing and placement of rock berms, with consequent reduction in depth, just north of a track commonly used by ourselves, between Pollard and, the new, Copperas buoy. There are now four yellow buoys, quite small, marking the hazard established 25th May 2012. At the suggestion of the MYA via the RYA Trinity House will be changing the southernmost of the yellow buoys to a South Cardinal. Trinity House have yet to advise when the change will be made. There has been a frenzy of activity over the past weeks since the wind farm developers created the cable crossing believing they the rights so to do, ignoring the agreement to consult the MYA. Seemingly no one knew what was happening. We are informed that there are to be a number of further cable crossings as the wind farms develop. However you will be pleased to note that there is now a consultative process in place involving all interested parties. The RYA in particular has been very busy in supporting the MYA and boating interests. farms at the point at which they cross. CLICK ON THE IMAGE TO OPEN IN A LARGER VIEW. Click Here to go to the full story on the RYA Website. 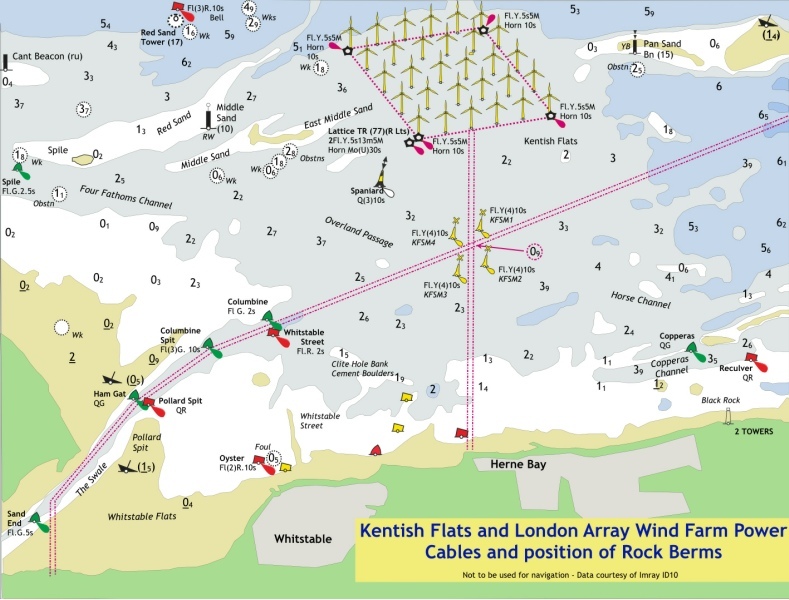 The RYA raised the issue of the reduced underwater clearance at the Kentish Flats/London Array export cable crossings at a recent meeting of NOREL - the offshore renewable energy forum. This is because, as a result of the rock berm, underwater clearance has been reduced to less than a Metre where the cables cross. The RYA was not aware that the cables would have rock protection until we received a notice. In an area where the London Array Offshore Wind Farm export cables and the Kentish Flats Offshore Wind Farm cables cross each other, these high voltage cables are being protected by rock placements. In total, four rock berms will be created, each approximately 150 metres long, 15 metres wide. Due to the height of the rock berms, the charted depth above these rock berms will be reduced to approximately 1 metre. The first rock berm has already been installed, and all the LAL export cables and rock protection is expected to be complete by the end of 2012. In light of this change in charted depth, the UKHO has issued a Notice to Mariners/chart correction (622/2012 and 930/2012) giving the new charted depth in the area. 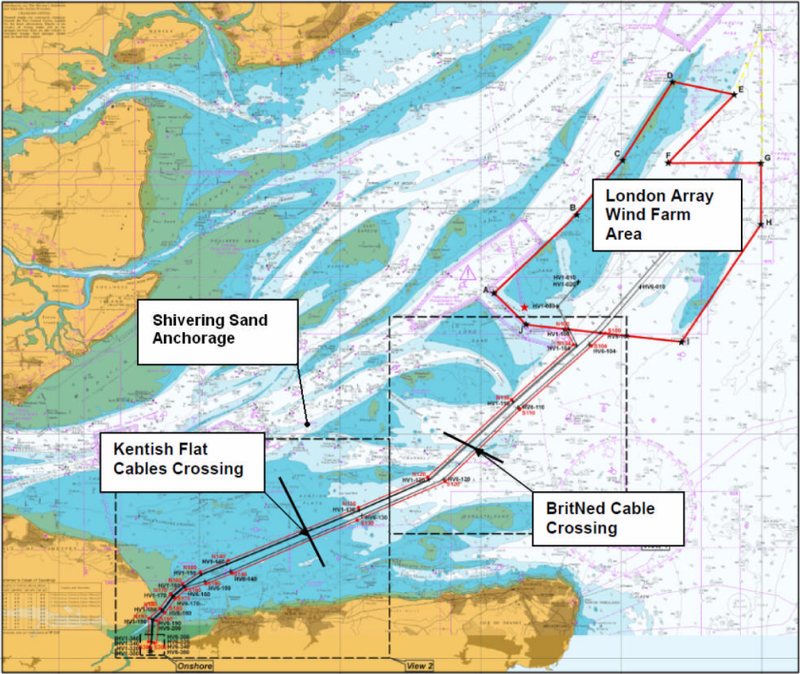 London Array Limited has consulted Trinity House Navigational Department. Trinity House has suggested that four special marks should be installed to square off the area of all four rock berms. These buoys will be installed in the near future. Once installed, a relevant chart correction/Notice to Mariners will be issued via UKHO and Trinity House. At the moment, a guard vessel is in position in the Southern Estuary. The guard vessel will at regular intervals broadcast navigational warnings on VHF Ch. 16.